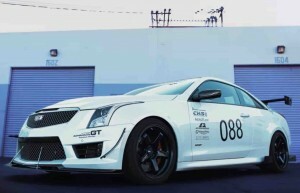 We recently filled you in on Renick Performance’s plans to spruce up the Cadillac CTS-V, but let’s take a look at what RP has been able to with the CTS-V’s younger and smaller sibling, the ATS-V.
As with the CTS-V, Cadillac did a great job making the ATS-V a respectable factory performance car. It may not pack as big of a punch as the CTS-V, but the twin-turbo 3.6-liter V6 LF4 engine and its 464 horsepower and 444 pound-feet of torque from the factory are nothing to scoff at. After all, it’s enough to get the ATS-V from 0-60 mph in 3.8 seconds, and can take the car all the way up to a top speed of 189 mph. In addition to its speed, the ATS-V is a capable car when it comes to being agile. However, it doesn’t decimate the competition. In fact, the new Alfa Romeo Giulia Quadrifoglio matches the ATS-V’s 0-60 time while also being the fastest production sedan around the Nürburgring. RP has stepped in to bring the ATS-V to that next level. The car shown above has been fitted with all the RP offerings, including an aerodynamics package, performance downpipes, and more. As we mentioned in the previous article, our own Manny Katakis had the privilege of getting behind the wheel of an RP ATS-V during its beta stages, and we’ll have more on that in the near future. For now, watch it carve through the country roads of Southern California in this short but pleasing minute-and-a-half video. Visit RP’s website for more information or to place an order. It would be so much better WITHOUT the music!